There are different shapes of cribs that you can buy. It is best to know about these shapes for you to make a precise purchase decision. Standard cribs – These are the most commonly purchased cribs and they come with four sides with wooden bars and a slat. Many designs are possible in these cribs and you can pick and choose. These cribs are also the most economical. Convertible baby cribs – These cribs look like standard cribs but they can be converted into day beds, toddler beds and even single or twin standard beds. These cribs are useful for letting your baby transit from a crib to a bed. Portable baby cribs – These cribs have wheels and this makes them portable. These cribs are useful when you want to keep an eye on your baby when you are at home – the crib can be rolled to any room inside your home. Travel baby cribs – These cribs are made of soft materials that can be folded so that the crib can get accommodated inside a suitcase. These are especially useful when you travel with your baby. The only disadvantage of these cribs is that they are not the sturdiest and this is why you should use these temporarily. The safety aspect is important when you want to choose a crib. You should ensure that the wooden bars are high enough so that your baby doesn’t try to scale them and fall. The crib should also be heavy enough so that your baby cannot move it around (this is an impossibility but you never know!). The material should also be sturdy, especially the floor of the crib and it shouldn’t break even when your baby is inside the crib and is playing. Wood is a popular material and it is eco-friendly too. Some of the cribs also have teething rails and you may want to consider this aspect because your baby is bound to dig their teeth into the rail – you don’t want them to fall sick. There should be enough space inside the crib and you should look beyond the standard size of 52”x27.8”. To ensure this, you should look at slightly larger cribs than what you need. Your baby will grow fast and you don’t want to invest in another crib shortly. Enough space inside the crib also keeps your baby comfortable and save you from its constant howling (that is the only way babies communicate their discomfort, don’t they?). As far as the mattress is concerned, look for a firm specimen. This will be good for your baby’s back. If the crib mattress is too soft, it may cause suffocation. Also, look at cribs where the mattress height can be adjusted. This will allow you to easily place your baby inside the crib. When you look at cribs, the manufacturers often show you recommended mattresses. It is a good idea to check this recommended selection out. Baby cribs have to do with aesthetics too. Blue and pink cribs are most popular for boy and girl children, respectively. However, there are several other options as far as colour is concerned, some of them highly attractive, and you may want to consider these so that the crib matches the rest of the room. Which cribs for which use? For the modern parents, convertible cribs prove to be extremely handy. 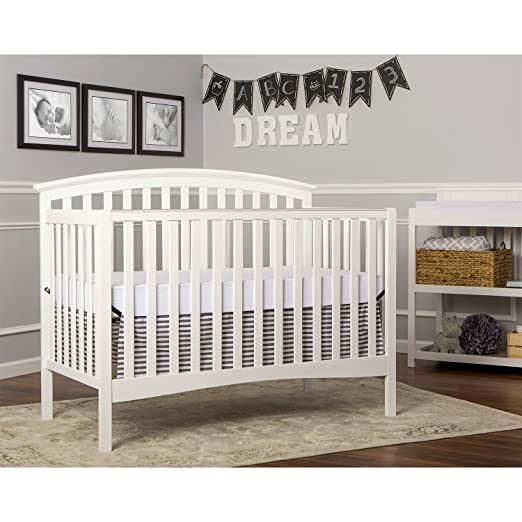 There are several models available in this category and the ones you should definitely look at are Dream On Me Eden 4 in 1 Convertible Mini Crib, Graco Bryson 4-in-1 Convertible Crib, DaVinci Alpha Mini Rocking Convertible Crib, Stork Craft Sheffield Fixed Side Convertible Crib and Fisher-Price Kingsport Convertible Crib. For parents who tend to travel a lot, travel cribs are extremely popular. If you fall within this group of parents, consider purchasing from the following models – Graco Travel Lite Crib with Stages Bassinet, Baby Time International Big Oshi Angela 2 Position Portable Convertible Crib with Mattress, Dream On Me Travel Time 3-Piece Reversible Portable Crib Set and Graco Travel Lite Crib. If you are looking for a crib with wheels, there is one option you should seriously consider – Delta Children Winnie the Pooh Gliding Bassinet.